The Air Density Separator's uniquely designed control system provides for optimal removal efficiency and allows for a curtain for air to be pulled across an adjustable separation chamber. Rocks, knots and unwanted debris drop out of the flow of material at this controlled separation zone while accepts are conveyed to a cyclone. Aside from protecting downstream equipment, the ADS's ability to remove knots and compressed wood greatly improves the pulping process and helps eliminate pulping rejects. The highly efficient design allows complete freedom in the placement of other process equipment, resulting in lower capital cost and ease of service and maintenance. 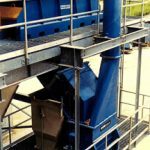 Each Air Density Separator is custom tailored to accommodate your specific process requirement, eliminating unnecessary energy consumption.